For years I have alluded to a few words, labels that help me find myself, travel is a constant desire to reinvent ourselves, into a better me. 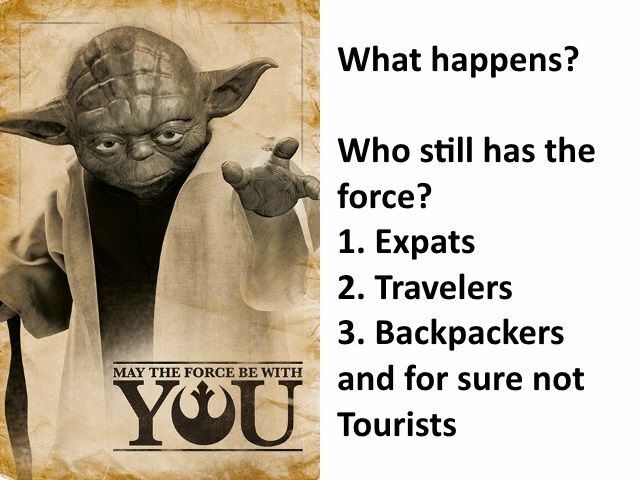 And, I actually travel with a backpack, a type of luggage many expats despise, which is fun, to have animosity towards luggage is not very open minded. Yet, the truth is, not all people can lift, and carry a backpack because their bodies are not capable, then others probably are seeking higher social status. While I see backpackers as higher social status, the more adventurous travelers, most expats see them as children. Wanting to be Young, or Wanting to be a Senior? I am presently near Cancun, Mexico on an island called “Isla Mujeres,” in another day I will leave here with a man named Brian, to introduce him to the world of backpackers, a culture, a lifestyle, a type of traveler. There can be retired people --- who are not tired; there is no reason for us to lose the light, to lose the force. It is my observation, there is continually two choices, one is to accept, and become comfortable, the other is to leave the house, to walk down the road with no plan, no desire to micromanage the day, to pick up our backpacks and leave. I Was Angry in Pizza Hut, "You can't call me that!" I thought to myself, there was no way at age 55 I was a senior discount person, and at age 62, why does she insult me? And, may the force be with you. Andy Lee Graham of HoboTraveler.com, May 19, 2018; sitting in a 5 Star Resort fully aware I am a backpacker, time to find the right path, to make the correct choice of the two offered me in life. Tom T (Grinder1) commented, and I saved. (Note: the trip to this link is a definite screw up situation, so I included it here, who knows, who cares, but a written blog post.